Prime Minister Stephen Harper's former director of communications Andrew MacDougal confesses to not always agreeing with the position he vociferously defended for the cameras. He also points out it's not only in politics that people disagree with the boss at times. His advice for the squeamish: "Wear a cup." The question I’m most often asked about my time in politics is what part of it I hated the most, which, I suppose, tells you something about the current perception of my former profession. And what do I answer? I could go with the usual complaints: the constant work, the travel and the dark cloud of knowing that your next mistake could end up being your last. But that’s the gig. Wear a cup. There was also the unremitting questioning of your motives by people who don’t know you at all. Get over it. And then, of course, there were the journalists. But the worst part of my job was having to promote and defend policies I didn’t agree with personally. When that happened, you had to do your job and toe the party line. Don’t shed a tear, because it didn’t happen much, at least not on issues that were core to the agenda, but consider yourself fortunate if you never have to look at a camera and argue with all of your heart for something you don’t believe in. Especially when, as happens in politics, you are standing on some thin intellectual ice. Maybe not, but it didn’t matter what I believed. I wasn’t elected. The government had an agenda and it was my job to talk about it. Members of parliament are rightly in a better position to question government policy, though if the reason they got into politics was to champion a cause they knew their party didn’t agree with, they probably shouldn’t have made the decision to run for the party in question. Politics is a team sport, but no matter how closely your world view lines up with that of your political party, there will always be areas where you disagree. Governments have to make decisions on too many files to achieve a perfect union between thought and action. Just as voters weigh the pros and cons of a particular party or leader before casting a ballot, and as candidates do the same before running for office, so do political staff before signing up for work. If you are able to find one party that speaks to you on every subject, I’d suggest you haven’t done enough of your own thinking. Parties — and leaders — are imperfect. And so that means as a spokesperson you’ll have to go out there and occasionally fire crooked arrows, sometimes at targets you don’t believe in or care about. To pick a particular pet peeve, no one can really mount a compelling intellectual or ideological defence of supply management for dairy, eggs and poultry. I certainly can’t. The few who happen to care about it — and benefit massively from it — just happen to be better organized than the majority of us who haven’t really thought about it, but might be outraged if we did. Never pick a fight with someone who produces their milk by the barrel, I suppose. So there I would be, defending supply managed industries every time we had a trade negotiation on the go, which was a lot. At the same moment we were fighting to scrap the wheat board. Yeah, the journalists loved pointing that one out. But this is where the critics in the ivory towers or op-ed pages often forget that politicians have to get elected. Yes, politics is theory, which is important to read and write about, but it’s also practice. It takes the vote of people and the support of stakeholders. And sometimes you have to promise them certain things. Even if it rubs across an ideological grain. Or common sense. I’m a cynic by nature, but politics truly does have a noble purpose. It is about leading people to change, about making arguments and showing courage. It’s also about picking your spots. Raising the age for retirement benefits was long thought to be a third rail in government, but the Harper government made that change to Old Age Security without future seniors storming the barricades. Let's hope we’re cruising to the point where we can start a conversation about retooling our creaking health-care system. And maybe one day we will free the cheese. But until that glorious day comes, and the time is right for change, political staff will inevitably find themselves agreeing with the proposition that the revered “ordinary” Canadian needs to pay too much for milk and cheese because 20,000 dairy farmers are afraid of duking it out with producers around the world. As a private citizen, I now get to say supply management is rubbish. I get to wonder why the Canadian Armed Forces can’t just buy kit off the shelf. I get to wonder why regional development agencies exist and why hundreds of government-funded interest groups never seem to conquer the problem they were “temporarily” set up to address. If you think defending the personally indefensible is a problem unique to politics, think again. Think about whether or not you could defend every action of your employer. Chances are you can’t. If you can, lucky you. I doubt many reporters could defend the decisions of their outlets 100 per cent either, especially those with corporate overlords. And what do I think about the CBC? I think that it receives significant taxpayer funds, and I believe it can operate within its existing budget. Beyond that, I couldn’t possibly comment. 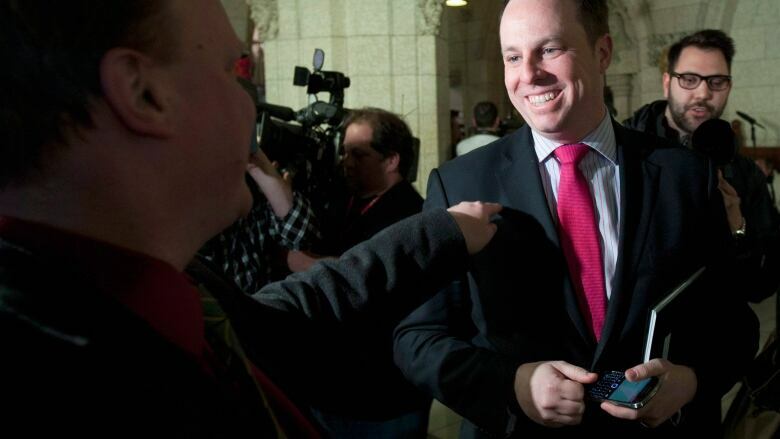 Andrew MacDougall is a former director of communications to Prime Minister Stephen Harper. He is now the senior executive consultant at MSLGROUP London. Follow him @agmacdougall.